Science of Annihilation is easily as heavy as the previous Hell Destroyer with most songs charging along at a blistering pace. As usual, one strength of Cage lies in their ability to craft a great metal arrangement without being overly redundant. Certainly, the galloping pace of power metal remains, but Cage is not afraid to change tempos midstream or blend in a judicious amount of melodic heavy metal. To this end, 'Scarlet Witch' or the most excellent 'Black River Falls' fill the bill. Another strength is, of course, Sean Peck's vocals and vocal arrangement. Again, Peck shows his awesome versatility from piercing screams to milder melodic diction. Take note of his work on 'Die Glocke' or 'Scarlet Witch,' two of the best songs on the album. Additionally, though the theme of Science of Annihilation is not quite is coherent as recent albums, the lyrical content is coherent, intelligent, and most often, down right heavy metal scary at times. The above strengths were also the weaknesses of Science of Annihilation. It seems that the overall song composition and, to a lesser extent, the vocal arrangements get the best of the guitar work. Cage has always had an awesome twin guitar assault. This time around the solos, though good, seem sparing, often brief, and sometimes muted against the rest of the song as on 'Spirit Of Vengeance' or 'Planet Crusher.' The emphasis appears to be more upon building chord development and coherent riffing. However, most songs are intensely and intentionally rich arrangements of heavy metal that, with additional listens and further dissection, may prove this theory wrong. Again, with Science of Annihilation Cage does not disappoint. They deliver some of the best and heaviest power metal this said of the Atlantic or Pacific. Science of Annihilation is another solid effort sure to have fans head banging and fist pumping. Very recommended! 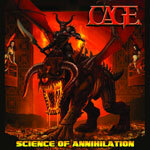 With Science of Annihilation Cage does not disappoint. They deliver some of the best and heaviest power metal this said of the Atlantic or Pacific. Science of Annihilation is another solid effort sure to have fans head banging and fist pumping.